Juicing is the regimen of consuming freshly made juices (made from fruit and vegetables) ONLY, for a set period of time. Juices are made with juicers versus blending, which some utilize for a smoothie recipe then strain off the fibre to yield juice. The absence of fibre from juices facilitates faster assimilation of nutrients by the body as well as swifter digestion. This is important for many reasons. One of the main reasons being that juices require very little energy to assimilate the nutrients they provide. 2. The body is afforded an opportunity to rest to a degree whilst still being nourished. It is ideal to make juices using a juicer, as blending causes rapid oxidation of nutrients making them void to the anatomy. Many persons prefer to juice in advance, not a recommendation on my part, but if chosen, it may be wiser to store at very low temperatures shortly after making with a good juicer( one which cold presses -masticating juicers versus high speed extraction/centrifugal juicers) if going to consume at a later time - this facilitates storing some of the nutrients. Additionally, to optimize the level of nutrients available to the body one should consume juices made within 10- 15 minutes of making. The best juices are made with a low rpm, twin gear masticating juicer for maximum yield of nutrients. : The O mega J8006 or Greenstar are two such juicers. Juicing is a great way to detox the body (will elaborate more on this in a separate article - 'Detoxify With Juices'). As the body utilizes little energy to ‘digest’ juices, for an extended period, it is afforded the opportunity to recover and heal. A five (5) to seven (7) day reboot of juicing is always beneficial. However, greater more effective benefits are possible over longer term ' feasting'(21+ days). Some persons may be served well to seek supervision as the body undergoes detoxing at a deeper level during a long term stint. It has been found that there are many avenues to detox, juice feasting being one of the ' milder ' forms, third to dry fasting then water fasting. This is a fact as the body is still being nourished as it still achieves some modicum of rest. In light of all these benefits, it is no wonder this protocol has become so popular, as the benefits, are far reaching and superbly effective. Some persons have found that their entire food selection and/or desires change after a juice feast. 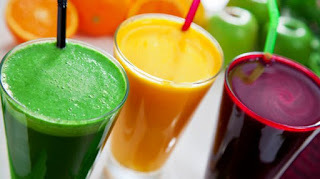 Having juices only for an extended time is referred to as a juice feast( not fast) for the simple reason that the body is still acquiring nutrients, whilst being afforded the opportunity to support healing modalities such as detoxification, organ regeneration, parasitic release, skin rejuvenation, shedding of dead cells more rapidly, allowing for smoother, clearer skin all over. Let me not neglect to say, it is also essential to note that many of these benefits may be enjoyed by 'supporting' protocols such as colonics and/or enemas, skin brushing, rebounding( or other effective cardio regimens), Formulation of ' tonic ' juices by incorporating ingredients which aid in this regard. These are little nuggets which may be employed to assist in being supporting tools to the maintenance of organ health whilst the body is 'open' to healing. As this might be very new to some persons, supervision may be the best approach. This is possible by at least two ways: Wellness Centres or Personal Coaching (one on one). Grab a glass and Let’s get healthy!